Void Salts are dropped by storm atronachs. Void salts are dropped by all varieties of storm atronach, including Pelagius's storm thrall, potent storm atronachs, and storm thralls. During this quest, you are asked to locate fine-cut void salts. These are just standard void salts (including same FormID), except given a different name. They appear under void salts during potion creation, and can be mixed with normal void salts. 1 sample of void salts is needed at workbenches to improve Nightingale armor, Nightingale boots, Nightingale gloves, or Nightingale hood (requires the Arcane Blacksmith perk). 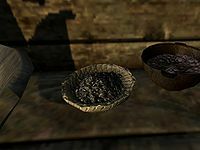 Void salts are needed at the Atronach Forge to create various storm atronach-related items, namely: a hostile storm atronach, a Scroll of Conjure Storm Atronach, a Staff of the Storm Atronach, or a Spell Tome: Conjure Storm Atronach. Void salts are also one of 4 items needed at the Atronach Forge to create random enchanted Daedric armor (requires the Sigil Stone). (DG) Once certain schematics are discovered during the Ancient Technology quest, one sample of Void salts is required for crafting a lot of ten of the Exploding Steel Bolt of Shock as well as for creating a lot of ten of the Exploding Dwarven Bolt of Shock at Gunmar's Forge. Fine-cut void salts may cause all of your regular void salts to be unusable to upgrade blacksmithing items such as the nightingale armor. To fix this, simply give the fine-cut void salts to Captain Wayfinder in Dawnstar. Alternatively, remove all of your void salts (as they all have the same id) by using the command player.removeitem 3AD60 X (X being how many you have both fine-cut and regular combined). Then type player.additem 3AD60 X to get them back. You should now be able to use your void salts again. Combining void salts with the fine-cut void salts will consume two void salts from your ordinary void salt pile, so long as you have two that can be consumed, allowing you to keep the fine-cut void salts. Doing this reveals all four effects of the void salts.